The pink & black Nokia N72 will soon be available to buy. 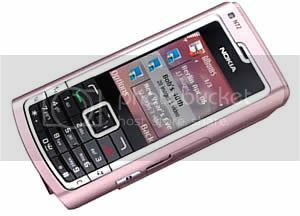 The Nokia N72 in Pearl Pink or Gloss Black features a 2.0 megapixel camera and includes a digital music player, with dedicated capture key, music player key, web browser, FM radio and support for Visual Radio. As GizmoWatch makes clear the Nokia N72 has currently been delivered to the Middle East and Africa, Russia, Eastern Europe, Mainland China, India, Indonesia, Singapore, Thailand, Vietnam and will soon be available to buy for an unknown price.